The delegation from CEPC was led by Shri Kuldeep R. Wattal, Chairman, CEPC, accompanied by all Members of Committee of Administration of the Council. A presentation was made about the economy and market position of the Yiwu City, by Mr. Wang Bi Rong. The Chinese delegation was very excited to visit the Expo and informed that they witnessed a very high quality in Indian handmade carpets, which they did not find in China. The delegation was confident that the Indian handmade carpets would get a very good sales response in Yiwu City. 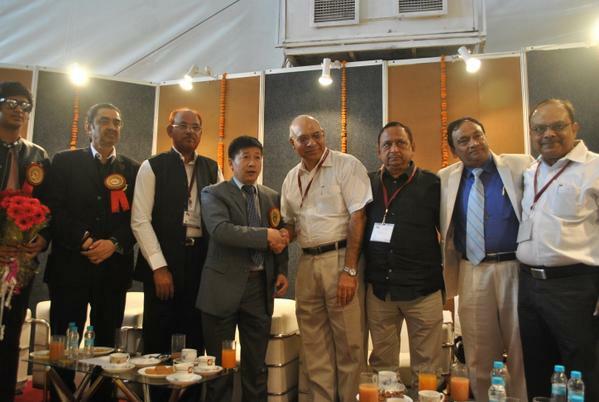 They informed that after the Expo, they will discuss with CEPC in arriving at a Memorandum of Understanding (MoU) for promoting and selling Indian handmade carpets in Yiwu. CEPC Chairman, Shri Kuldeep R. Wattal expressed hope that such collaborations would give a boost to exports of Indian carpets to China. Shri Ravinder Jaiswal, MLA, Varanasi also visited India Carpet Expo and saw the arrangement and facilities available at the fair ground. He met the participating exhibitors also and appreciated the new developments made by the Indian carpet manufacturers. He met overseas buyers and Chinese delegation as well and assured the carpet exporters and CEPC that he will apprise Hon’ble Prime Minister Shri Narendra Modi of the efforts made by Carpet Export Promotion Council in providing excellent infrastructure to the manufacturers from Varanasi-Bhadohi-Mirzapur belt in promoting Indian carpets and helping the artisans and weavers of this area.